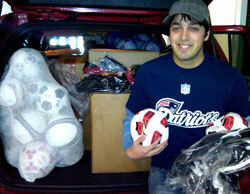 Mark Moniz, Middle School Athletic Coordinator for America SCORES Boston shows off the car load of equipment and soccer shorts he received from Dream Big! 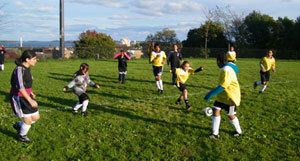 for America SCORES elementary and middle school girls soccer leagues made up of 330 girls. 150 of these girls will be participating in the program for the first time. America Scores athletes show of their skills. Thank you America Scores for all you do to get girls involved in sports. A very special thank you to uniform sponsor Coaches Across Continents for their wonderful donation of soccer uniforms to Dream Big!. Or visit our Contact Page.